When the brilliant classical architect Charles Barry won the competition to build a new, Gothic, Houses of Parliament in London he thought it was the chance of a lifetime. It swiftly turned into the most nightmarish building programme of the century. From the beginning, its design, construction and decoration were a battlefield. The practical and political forces ranged against him were immense. The new Palace of Westminster had to be built on acres of unstable quicksand, while the Lords and Commons carried on their work as usual. Its river frontage, a quarter of a mile long, needed to be constructed in the treacherous currents of the Thames. Its towers were so gigantic they required feats of civil engineering and building technology never used before. And the interior demanded spectacular new Gothic features not seen since the middle ages. Rallying the genius of his collaborator Pugin; flanking the mad schemes of a host of crackpot inventors, ignorant busybodies and hostile politicians; attacking strikes, sewage and cholera; charging forward three times over budget and massively behind schedule, it took twenty-five years for Barry to achieve victory with his 'Great Work' in the face of overwhelming odds, and at great personal cost. 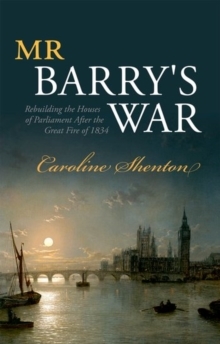 Mr Barry's War takes up where its prize-winning prequel The Day Parliament Burned Down left off, telling the story of how the greatest building programme in Britain for centuries produced the world's most famous secular cathedral to democracy.